Offering you a complete choice of products which include obstetric bed - multi function and gynecology table - dismantled (with accessories). This table is designed for women's obstetric and gynaecological operation, Easy operation, safe and reliable, economical and quick. Operating positions - up / down, forward and backward tilt are controlled by smooth hand wheel. Comfortable for both doctor and Patient. Length and width for tabletop: 1800 x 600 mm. Height adjustment range: 660 - 920 mm. Dimension of sections: backrest: 600 X 800 mm, Seat section: 600 x 400 mm, Leg section: 540 x 500 mm. Max. degree for backrest adjustment: more than 60 degree upwards, more than 10 degree downwards. Max. degree for tabletop forward and backward tilting: more than 8 degree(forward), more than 20 degree(backward). 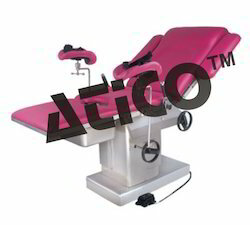 Made in 3 sections, adjustable back rest and leg section with lever mechanism to varying positions, capable of tilting for obstetric and gynecological use. Legs mounted on rubber tips. Size : Table 1800L x 600W x 800H mm. Tubes : 30 x 1.5 mm. Supports for leg holders with solid mechanism to fix leg holders at required height and width. Supplied with 2 leg holders with canvas straps adjustable in height and width. Epoxy coated tubular steel frame. Tubes : 30 x 1.5 mm. Mattress-pad : density : 21 - 25 kg/m³. Carrying capacity : 150-180 kg. Supplied with 4 liter S.S. Bowl. Note : Available with knee crutchers on request. 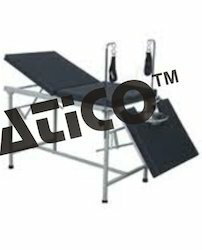 Looking for Hospital Obstetric Tables ?